Today when we think “lightweight car,” we think aluminum. We think magnesium and carbon fiber. We think higher-strength steel instead of larger quantities of it. We think taking out our rear seats, stripping down the interior, removing the stereo, and shedding extra pounds wherever we can. Chances are, we’re not thinking “wicker basket.” But in the late 1800s, that’s exactly what early car manufacturers were thinking. Back in an era when lawlessness and innovation reigned, auto makers looked to everyday life for inspiration. No one had really set a precedence yet and no one had any idea what actually worked. So, back then, when people thought “lightweight car,” they were thinking “wood,” not metal. And, more specifically, they were thinking of the weaved wicker baskets that had been pretty effective in making carriages, chairs, and the baskets of hot air balloons. It seemed like it would work. 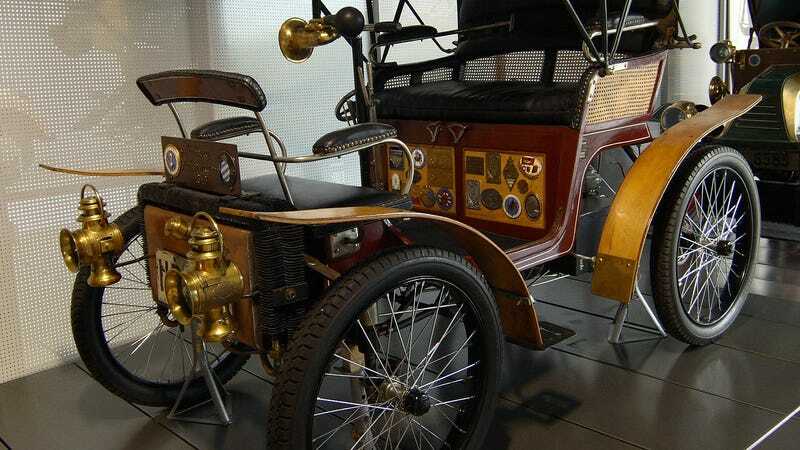 The two earliest examples are the French-made 1897 Hugot and the 1898 Wartburgwagen made by the German Eisenbach Company. Not a whole lot is known about the origin of the Hugot, but the October 1985 issue of Popular Mechanics (yeah, we have to go that far back) and Marco Matteucci’s book History of the Motorcar both depict the finished product. It was a pretty simple body made entirely of wicker—including the mud guards. Tucked under the seat was a insanely powerful single-cylinder 3.5 horsepower combustion engine. It was a bit of a wild card even in its day, but it would have been a lightweight and familiar option for people looking to move on from the horse-drawn carriage. The Wartburgwagen, on the other hand, was the first usage of the Wartburg brand by the Automobilwerk Eisenach in 1898, and it was a little more sophisticated than its French predecessor. In Peter Roberts’ A Pictorial History of the Automobile, the car is described as having a two-cylinder 765cc rear-mounted engine with a top speed of 25 mph at its best. The whole “wicker” concept meant this car didn’t get a ton of attention either—pretty soon, they switched over to a wooden bodies and mudguards, leaving the seat the only wicker component on the car. Wicker wasn’t massively popular. It could be found every now and again through history. In 1915, the Gadabout Model G featured a wicker body; German manufacturer Hanomag made a budget-friendly wicker version of its steel Kommissbrot; and Bugatti included a few wicker features in the 1920s and ‘30s, but nothing really stuck. Wicker might be lightweight, but it’s also not sturdy, and it is most definitely flammable—it’s not rocket science to see why today we’ve opted for some more robust materials. But if you had your heart set on driving a wicker vehicle, then surprisingly, you’re in luck. In 1915, Clyde Osborn drafted up an electric wicker cart inspired by the wicker tourist chairs that were pushed by hand. They were used in vacation destinations around San Diego and San Francisco before fading into oblivion—until Sandor Shapery decided to bring the wicker carts back in the early 2010s. They were reintroduced to Balboa Park in 2016 and were so popular that August 14, 2016 was officially proclaimed Electriquette Day by the Mayor of San Diego. Wicker-body cars never really took off for plenty of understandable reasons. But that automotive era of wild abandon, where people just tossed together cars with whatever they could find to make a seat go forward, would have been an incredible thing to watch.